My son has been bugging me to cook him a Halibut meal ever since he spotted it in some cooking shows some time ago. The first time Jonathan tried Halibut was during one of our fine dining outings; can’t exactly recall where, but he liked it a lot. 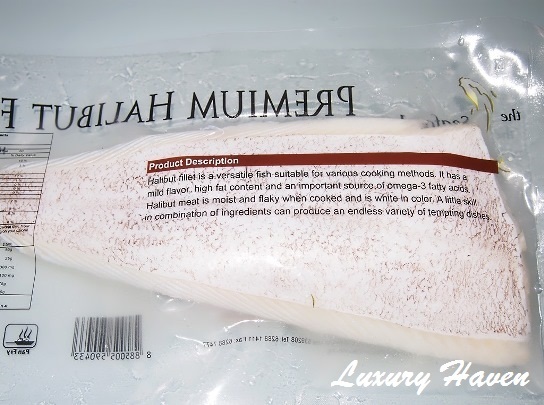 Spotted some frozen premium #Halibut fillets at the Cold Storage supermart & decided to make one for him. Like most teenagers, Jon prefers western cuisine. So I put on my “Chef’s Hat” & played along, whipping up half of the frozen Halibut for my dear boy, but with an Asian twist. Preheat oven to 250°C, depending on your oven temperature. 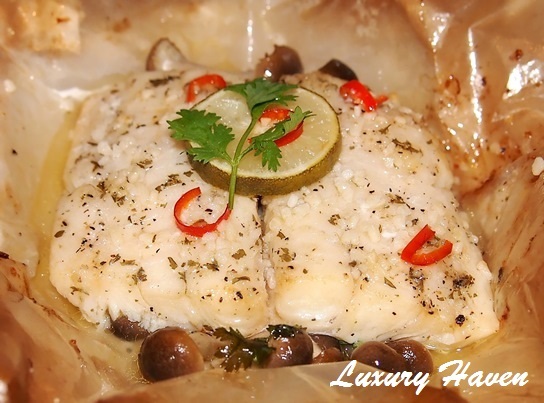 Marinate fish with salt, pepper, garlic, ginger & parsley flakes for about 30 mins. Cut parchment into half & grease paper with butter leaving the sides untouched. Line tray with paper. Mix mushrooms & parsley leaves with butter & place onto paper. Place fish on top. Add sliced chilli, lime, more parsley. 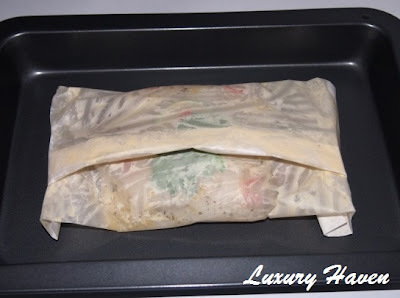 Drizzle wine & olive oil, & wrap it up neatly. Bake for about 10 mins & remove to check. Stick a toothpick & if it goes through easily, fish is cooked. 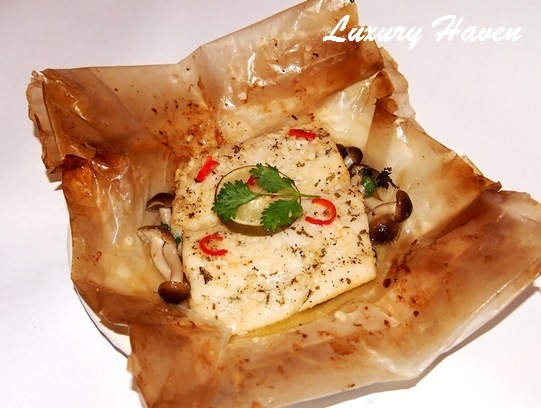 Enjoy your aromatic Baked Halibut With An Asian Twist! Start shopping & #cookforfamily now! Ken, it's a great combination in both texture & smell! Eric, I'm in seventh heaven with compliments coming from a Chef! Thks, dear! Henry, I don't like fish too; just cooking for my 2 men. Heehee! Kathy, it's quite simple & so healthy. Looks delicious, Shirley! You're such a great mom. Looks very fresh and delish! I just had some hilibut, but pan seared with butter. O Gosh...I am going to make it again for the dinner tomorrow. 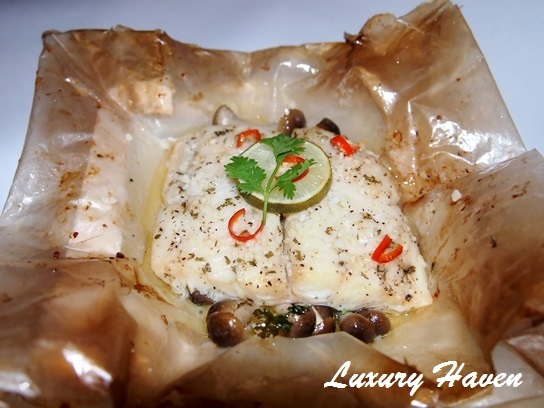 Good idea to cook halibut this style! Usually use that fish for deep frying - the fish and chips style only. This recipe would save so much trouble and it's healthier too. Wow, another masterpiece ! Awesome dish, I like fish cooked by baking like this a lot. Hi Shirley, happy to share my Very Inspiring Blogger Award with you & a few others. Please collect it from my blog (check out my blog for rules) & you select a few fellow bloggers to pass on the award too...:) Happy Blogging!! Oh!! 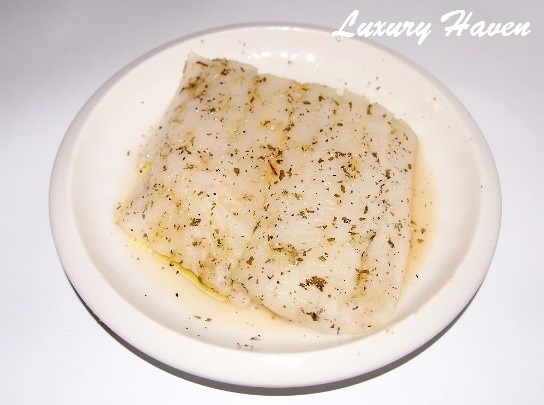 Your baked Halibut looks delicious! My kids are a big fan of fish. They love fish pan fried or steamed. Never tried baking for them. I will try your recipe but I think it is quite hard for me to looks for Halibut here. Can I try with other fish? 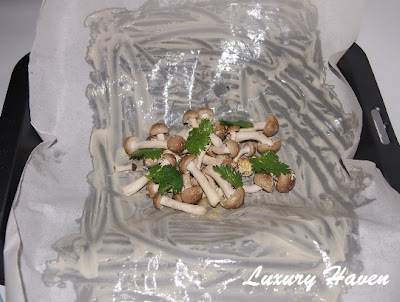 Another interesting ingredients you use is the shimeji mushroom. I love mushroom and I bet they paired wonderfully! Our theme for this month is 'mushroom'. hi!! stumble upon your blog through yuhjuin's blog!! you have a really nice blog! and all the food post make me drool! my mum would love to view your blog because she loves cooking too!! i've followed you blog! i'm glad i found it! Hi Shirley! Nice to read a recipe post from you again! I'm sure your boy loves this dish prepared with so much love by Mummy?! Alvin, I hardly have time to cook these days but I'll try to. Thks for coming by! 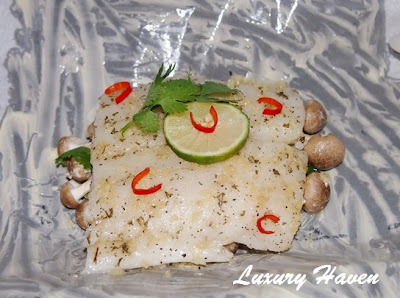 So nice how you prepared this halibut...love the Asian twist...healthy and very tasty. Juliana, thks & u have a good week too! 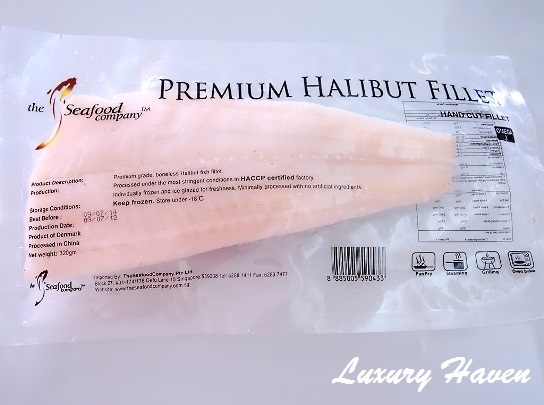 Halibut is delicious but it has more than doubled in price in recent years and is not as easily available any more. I used to steam it Chinese style as the flesh is so sweet and tasty. Your baked version sounds delicious too! Hope you had a lovely Mother's Day. Biren, we're getting more varieties of frozen fish here in S'pore. Those days was just Dory. So it's really convenient if we can't find a wet mkt. Happy belated Mother's Day to u too, dear! Amazing dish, look very delectable. You sure got black belt in cooking with the extra ingredient call 'love'. I'm sure your son enjoyed till the last piece on the plate? Amelia, u're real cute! Lol! And u've black belt in baking?? Hahaha! WOW! Looks good. and the best thing is that its easy to prepare. Just prepare the ingredients and wrapped them all up! Looks and sounds very tasty! I'm a huge fan of white fishes and I love seabass steamed with a thai style lime sauce! Sharlynn, cool! That sounds like a yummy dish too!